We went to Shepherd’s Harvest yesterday, my annual Mother’s Day splurge. I may have overdone it on Spinner a wee bit with the knits, but seriously, how could I not? 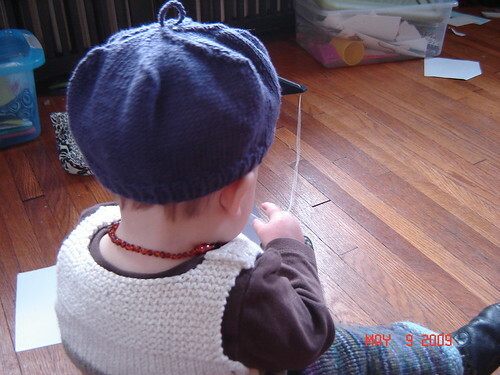 Debbie Bliss garter stitch sweater, Picky Pants, Norwegian Baby hat, and Pebble vest. He was very much adored as we walked around the festival. 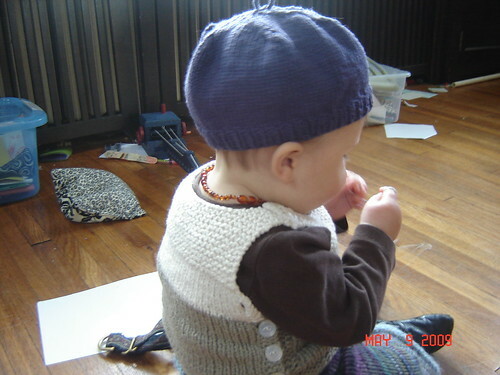 When we got home, I did another photo shoot in his vest and that tam he was meant to be wearing, which was vetoed by the Skeptic since “it doesn’t cover his ears” and it was windy. 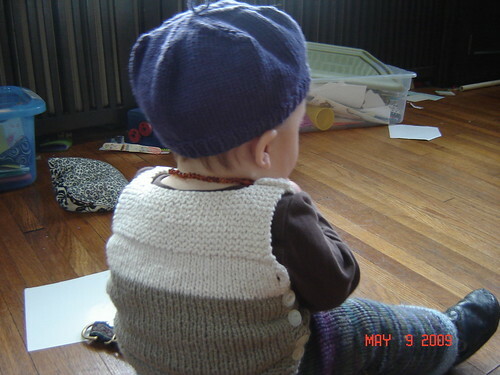 The sweater, the vest and tam are all recent additions to the collection, finished up this spring. 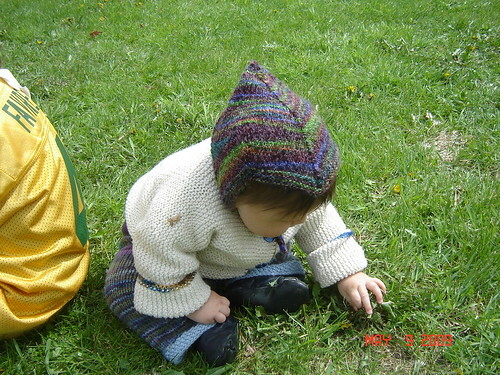 I’ll get my details up in Ravelry later, but my thoughts for now…. 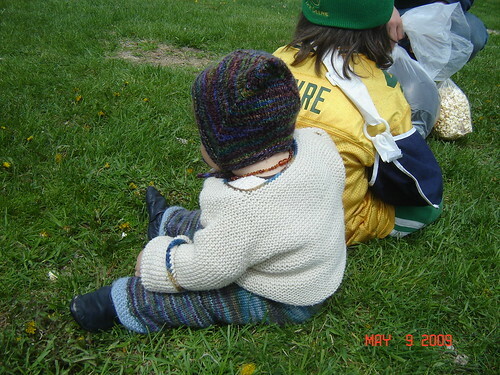 Debbie Bliss garter stitch sweater: I think I’m pretty much close to gauge (I should check) but it is HUGE. I knit the 3-6 month size, took six stitches off the length of the sleeve and and the sleeves are still way too long. They are designed to be rolled up but still…. The Pebble vest? 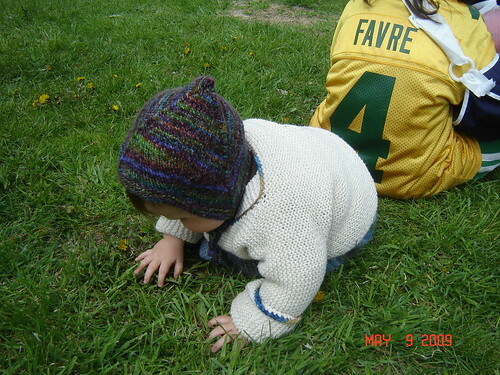 Knit one now, that’s all I need to say about that. I used Mission Falls cotton. The tam was from a ball of Rowan Calmer I’ve had sitting around. I used Ann Budd’s pattern book to figure it out. Could e a bit longer and I should block it, although I do like how it’s sort of puffy right now. Oh, and the purchases? Since we now have a gajillion $$$ in medical bills, I kept it to a minimum. Susan Hensel had some killer batts, and she had a build your own batt station set up. I bought the black one, the blue one I put together myself. What an awesome idea! 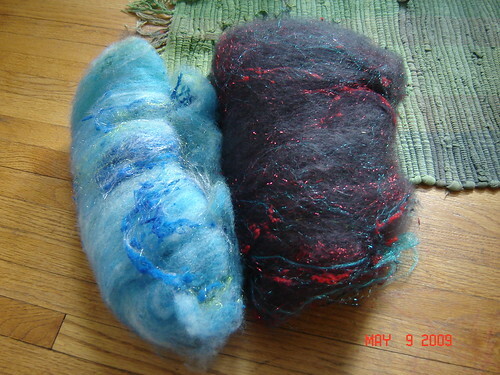 From Winterwind and Crosby Hill I bought 8 ounces of CMV roving, a bag of mohair locks (I’m determined to figure them out) and two CMN/mohair batts. Bottom line, a great Mother’s Day! Oh, and readers? Lastly I just want to say thanks again for sticking around…your kind words have meant more than you know! The cute! It burns! Ow! So darn cute! Thanks for the Pebbles pattern recommendation. You bet! It’s a fun one to knit. What an adorable baby! We went on Saturday and had a great time. I gave them all my money. It was worth it, though, to discover so many GREAT new yarn producers. I think we may be getting a bunny now, too. . . I was so tempted with those bunnies!! CUTE! I just want to squeeze him. Too cute. Too cute. I can’t believe how big he is. I know it is’nt funny but I’m still laughing at how he broke his arm, it is so true it is always something simple that causes the most damage. My youngest daughter was sitting eating icecream with her Dad fell off the chair (not with a crash) got up and looked at me with a bloody mouth (she had hit her mouth on the table on the way down). After I cleaned the blood from her mouth, she asked for icecream with a smile, and thats when I realised she was missing her front tooth!!!!! I found it on the ground, she did’nt just break the tooth she knocked the whole thing out root and all. She was only 2, lucky it was her baby tooth, but for 5 years she was missing a front tooth. Yup, that was me sitting at the spinning wheel at shepherd’s harvest wearing the koolhaas. 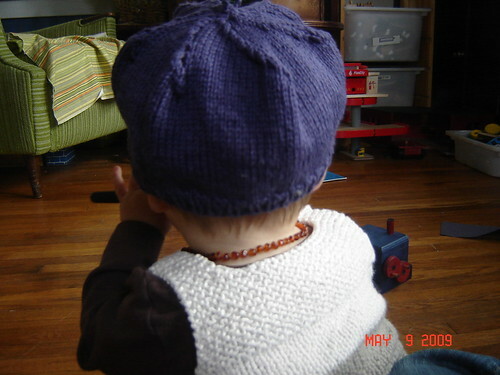 Isn’t it funny how we knitters identify others with the type of knitted object they are wearing? 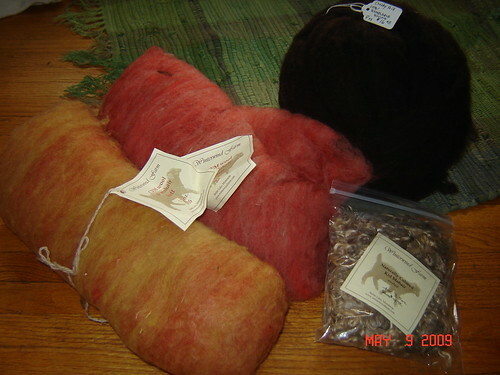 I hope you enjoy the fiber that you bought from our stand, I know I love spinning it. You have a beautiful blog. Glad you had a nice mom’s day. So cute! Cute knits on a cute model!